Claudio was awarded his diploma in vocal studies from the “Cesare Pollini” conservatory in Padua, under the guidance of Adriana Rognoni, Claudio Zancopè furthered his vocal technique and lierder studies with the acclaimed repetiteur, Enza Ferrari and with the bass, Malcolm King. Under Maestro Paolo Vaglieri, Claudio turned his specific attention to studying and perfecting operatic repertoire. Winner of the “AS.LI.CO.” competition in Milan and of the International Competition “Riccardo Stracciari” in Bologna, Claudio then made his operatic debut singing Leporello in Mozart’s “Don Giovanni” with Leyla Gencer and as Bartolo in Mozart’s “Le Nozze di Figaro” with Graziella Scuitti. His operatic activities have led him to perform in many Italian theatres such as: “Il Teatro Donizzetti” in Bergamo, “Il Teatro Grande’ in Brescia, “Il Teatro Comunale” in Treviso, “Il Teatro Sociale” in Rovigo, “Il Teatro Verdi” in Padua, “Il Grande Teatro La Fenice” in Venice and at various musical institutions such as: “Asolo Musica” and with many ensemble groups such as: “La Stagione Armonica”, “Concertus Vocalis”, “I pomeriggi musicali di Milano”, “The Chamber Orchestra of Belluno” and “The Arcimboldo Ensemble”. His recent tour in German brought him much acclaimed success. 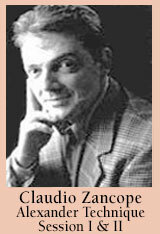 Claudio Zancope performed Haydn’s Mass under the direction of Maestro Massimo De Bernard in Savona and the premier of “Baldassarre Galluppi’s” Gloria at the Basilica of San Marco in Venice under Claudio Scimone. Claudio’s repertoire spans from 1700 to the present day in both opera and chamber music. In 1999, he performed the role of The King of Baldassarre Galluppi’s opera “Il Re alla Caccia”. In 2001 he performed in the world premier of Marcos Antonio Portugal Da Fonseca’s comic one act opera “lo Spazzacamion”. Mr. Zancope is a member of the Society of Teachers of the Alexander Technique (STAT).